Now I have news for you!!! 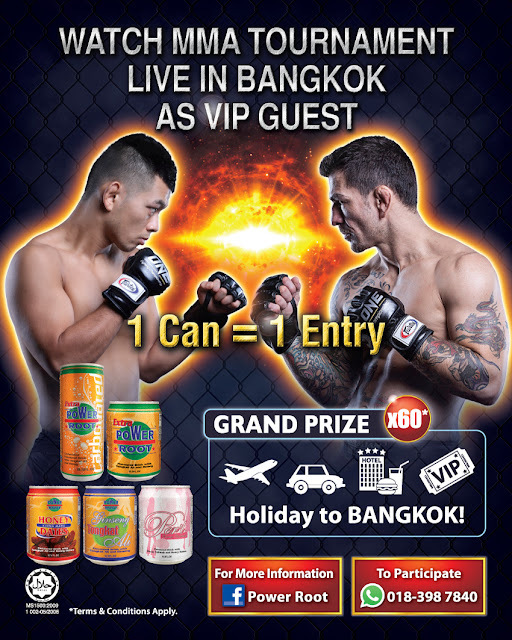 Extra Power Root energy drink is giving Malaysians a chance for a “Boost of a Lifetime” nationwide contest with 60 Grand Prizes: An All-Expense Paid VIP Trip to Bangkok for a chance of a lifetime experience at ONE Championship this 17th December 2016. Extra Power Root is also the Official Energy Drink for ONE Championship events in Malaysia. The nationwide contest is happening now and will be concluded on the 13th November 2016. So hurry ya!!! · Hotel Accommodation, Meal & Transportation. · Exclusive VIP tour on Fight Night itself to witness what goes on behind the scene as the ONE Championship fighters prepare for their match and see the path they take as they emerge onto the ONE Championship stage in a money can’t buy experience! Awesome right.... I know I wish I can be there!!! A purchase of only one can per entry is required. Extra Power Root has been championing the local sport scene in recent years with sponsorship of local football team (PKNS) and other sport athletes like the multi-talented Professional MMA Fighter, Peter Davis who’s also a local model, an actor and TV host. Extra Power Root also understands the importance of grassroots athlete talent development; therefore, Extra Power Root is the official drink sponsor for ONE Championship and also the sponsors of Malaysian Invasion MMA (MIMMA). This will be the 2nd year the brand has been involved in the sports of Mixed Martial Arts and will continuously be on the lookout for talents and sports to support in the coming years.